Custom design and built by the owner. Jacuzzi in master and downstairs baths. Spectacular views of Gardiner's Island and Gardiner's Bay. 2 zones of central air. Hi speed wireless router included. Beach and bath towels provided. Huge deck for outdoor parties. 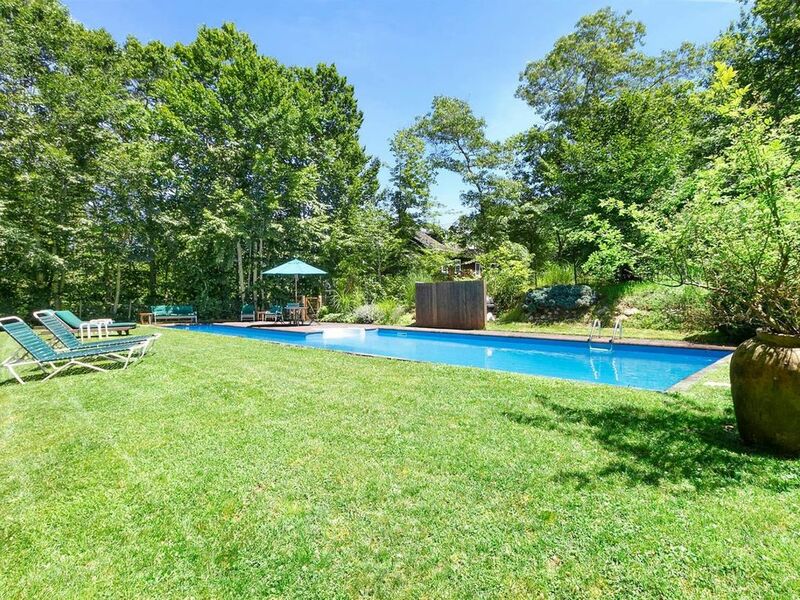 60' heated pool with lap lane. Post-modern style home on 2 secluded acres bordering 102 acres of preserve and protected land and spectacular year round views of Gardiner’s Bay and Gardiner’s Island. Inside are four bedrooms including 2 master suites and private upstairs deck, great room with 26’ cathedral ceiling, fireplace, antiques, 2-zone central air and 2 whirlpools. Outdoor features include huge deck for entertaining, teak furniture, gas grill, outdoor shower and 60’ heated pool. Bike to ocean and towns of Amagansett and East Hampton. Exellent rental. Great pool. Very quiet! Cleaning fees, security and utility deposits change based on the length of your stay. Please contact for the correct amounts.